I joined the Peace Corps June 10, 2004. I was 55 and my husband Woody was ten years older. The application process took us two years, as our commitment to Peace Corps would be. I’d initially ignored my husband’s suggestion, two years earlier, that I “just check out their website.” But after two weeks of seeing him so excited by the idea, I finally did. He’d sprung his “I think we should join Peace Corps” idea in late May of 2002. At that time we’d not yet been married three years and — critical piece here — he’d retired the year before. For nearly thirty years, he’d been a professor of Speech Science at Temple University in Philadelphia and had traveled and written widely in his chosen subfield, stuttering. He was looking for a new challenge. I was not. I already had a life I loved, including a new career. 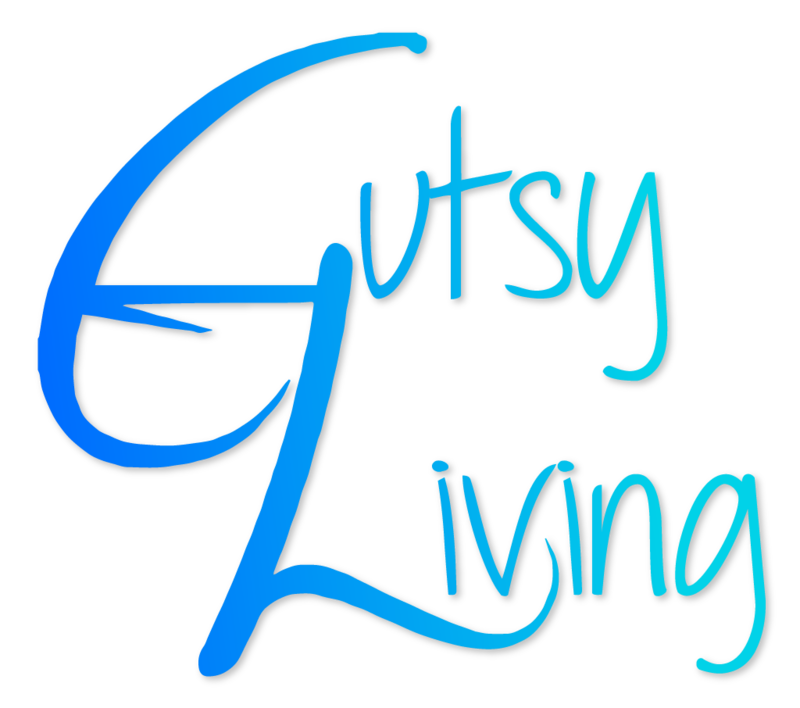 After a lifetime in the non-profit world raising money and organizing volunteers, I’d completed an extensive three-year training in Gestalt psychotherapy and, five years early, had opened what came to be an inherently rewarding private practice in the living room of my three-story Italianate home on Philadelphia’s west side. I also loved playing host parents with Woody to foreign students living on our third floor. They came generally from parts of Asia and South America, and were enrolled in the University of Pennsylvania’s ESL program. The students filled our home with youthful energy, new ways of seeing the world, and a very nice rental income. It was a life I envisioned having into my eighties. But, the Peace Corps had been a dream of mine since I’d watched my college classmates join and go off to parts unknown nearly forty years before. I hadn’t applied in 1971 because I was sure the stuttering I’d struggled with since childhood would keep me out. By 2002, my stuttering had been a non-issue for many years. Besides, Woody felt that if we were ever going to go, the time was then — he wasn’t getting any younger, after all. Browsing through their website, reading about the places we could go, people we could meet, work that was waiting for us, I was smitten. Within two weeks, we’d sent in our online applications. I could be a Peace Corps Volunteer (PCV) after all. 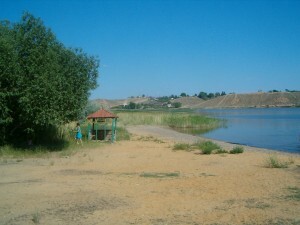 My memoir, At Home On the Kazakh Steppe, tells the story of this mid-life jump into the unknown. But it doesn’t tell much about what I left behind. Somehow, writing about it felt like whining. I did, after all, join voluntarily. I did sell my Philadelphia home with the six-foot-long tub and French bidet I’d added during renovations only a few years before. I’d sold my two-year old car for one-third what I’d paid for it. I’d parted with furniture I loved; hundreds of books, some of them mine since high school; closets full of clothes; stuff. It was all just stuff, I reminded myself. And it still feels like whining. Except for Merlin. A rescued greyhound, Merlin came into our lives in August of 1999. Woody and I joke that we got married just so we could adopt him. Not my first dog by any means, but a different dog than any I’d had before. He carried himself with a graceful dignity that let us know that chasing a silly ball — never mind bringing it back just to do it again — was beneath him. He taught me patience (ever a challenge), and he was truly the world’s fastest couch potato. He and I bonded quickly, and life without him was unthinkable. Until the Peace Corps entered the picture. During the final year that it took for our medical clearance to come through, we lined up a foster home for him. But in the weeks before our departure, the family’s circumstances changed and they had to renege. With two weeks to go before we were scheduled to leave, we found a second family who wanted him, but they would take him only if they could keep him. I was devastated. After forty-eight hours of angry, broken-hearted sobs, I signed him over to them permanently. Such was the pull that becoming a PCV had on me. Though I’d wanted to join Peace Corps for nearly forty years, by the spring of 2002, there was an even stronger pull on me to join. With the fall of the Twin Towers, Woody and I felt an unusual type of patriotism. Initially proud of the outpouring of public sympathy, even from longtime adversaries of our country, we were dismayed to find that support evaporating as our country drew closer and closer to war. We wanted to take a stand, make a statement, and be counted among those who preferred peace. The Kara-Kengir river flowed into and through Zhezkazgan, where we lived. A bit upriver, and out of town, this was the scene of a great picnic one May afternoon. I’ve only mentioned the permanent losses (or what I believed at the time were permanent; we actually did get Merlin back and enjoyed him for four more years). I haven’t talked about leaving behind my network of friends and colleagues, not being able to participate in two years of my grandchildren’s lives, or leaving the rest of my family: the part of my life I put on hold. Some of this was mitigated by technology: the Internet was far more available than I ever imagined it could be in a Peace Corps country. But the pain of letting go of attachments — what had, according to the Buddhist teachings I am drawn to, created my misery — did not hit me until it was too late to grab any of them back. 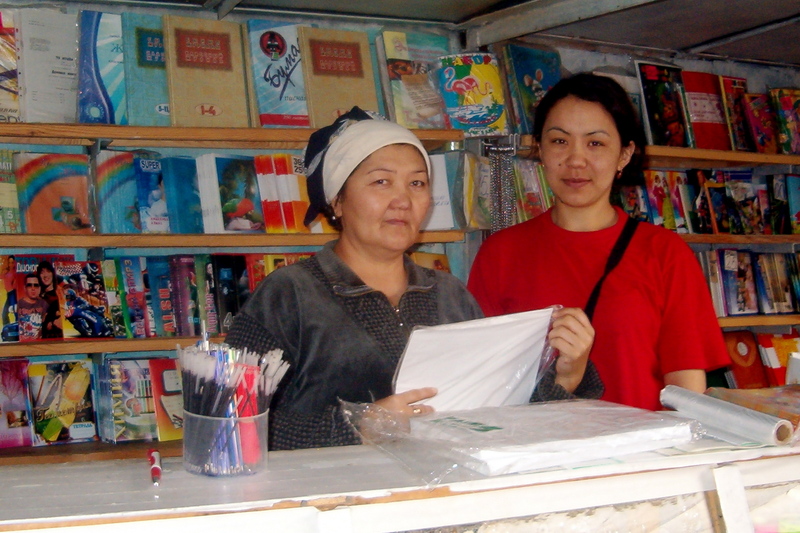 These ladies sold paper products at the bazaar in Kazakhstan. They wanted their faces to get to America. People often comment on how brave we were. I can see how it might look that way: newly married, older couple abandons worldly possessions in pursuit of loftier goals. But I never felt it took any particular courage. In fact, I’ve come to believe that by leaving so much of what I valued behind, I was more committed to success — to “making a difference” — than I might have been otherwise, though I was never sure what that “difference” might be. In writing my memoir, I’ve discovered the difference I really made was in me. NOTE: The Peace Corps is a U.S. State Department program begun in 1961 by President John F Kennedy. Since it’s beginning, it has had three goals: To provide training and skills to countries that ask for our help, to bring aspects of our culture to the people in these foreign lands, and (when we return) to teach about these cultures to the people of the United States. 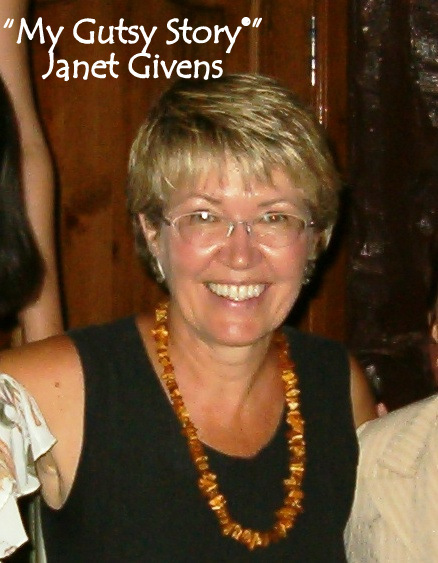 JANET GIVENS BIO: Just when her life felt right — new home, new grandchildren, new career, new husband — Janet Givens left it all behind and, with her new husband, joined the Peace Corps. The latest of many jumps into the unknown, her two years in Peace Corps were filled with struggles, surprises, and rewards, vividly recalled in her memoir, At Home on the Kazakh Steppe, out later this year. SONIA MARSH SAYS: Since I have a strong desire to join the Peace Corps, it was interesting for me to read how you felt prior to leaving. I look forward to reading your memoir and the adventures and misadventures you had while in Kazakhstan. The part that intrigued me was your personal discovery. “I’ve discovered the difference I really made was in me.” This is what happened to me after my year in Belize. 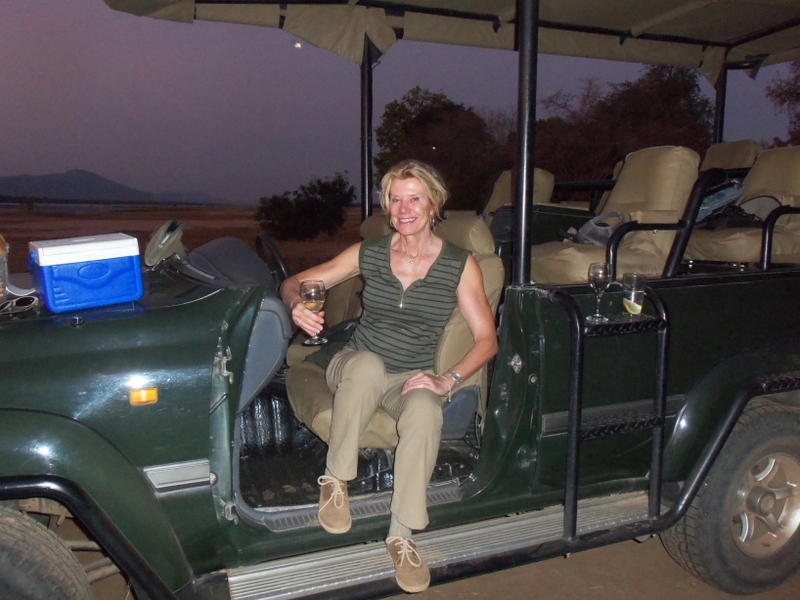 I look forward to reading your memoir and learning more about the Peace Corps, Janet. Thanks for sharing your story with such honesty. Thanks for asking me, Sonia. You make it quite easy to post here. It’s been a pleasure to work with you. Janet, This is wonderful! Your story behind the story is just as compelling as your upcoming memoir, which I am anxious to read. I can see why you and Sonia bonded so quickly. To be able to sell everything and pack up for another country takes a lot of gutsiness, for sure. You are so right, it’s only “things” and it sounds like you gained far more than you gave up when you took this risk. Very intriguing. And our network grows. 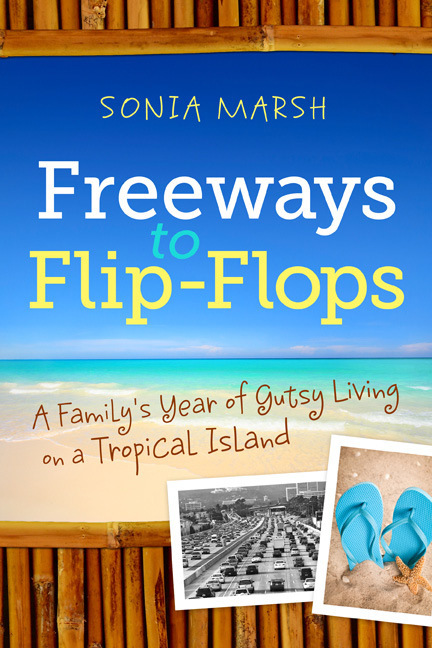 I met Sonia through your blog at Memoir Writer’s Journey. I thank you for that. You know, as I read through this post, I thought it all sounded quite methodical: get rid of books, sell furniture, sell house, place dog … And as I tackled each one it was indeed like checking them off a master list. THEN, it hit me and I wanted them all back. I think my inner-three year old didn’t quite come through in this post. Oh well. I applaud you, Janet. I have always thought that since I let my 20s pass without doing the Peace Corps that I never could. You’ve made me want to look into it again. Thanks for being brave. Thanks for standing up for peace. 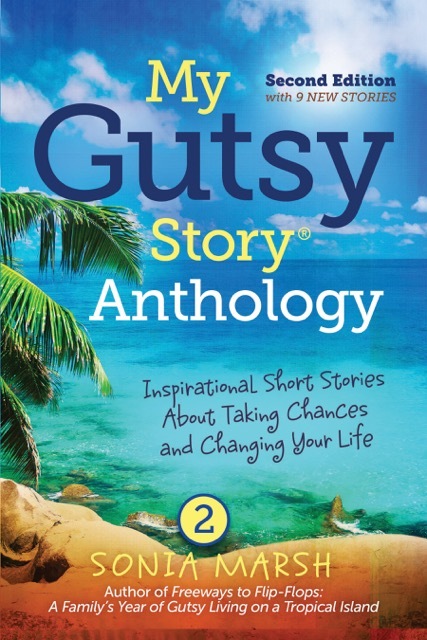 Thanks for sharing your Gutsy Story! Carol Bodensteiner recently posted..Why do we smile? I’m glad, Carol. I think you’ll find the peacecorps.gov website filled with exciting possibilities. Thanks for commenting. What a wonderful and courageous life experience! I am in awe of the changes you had to make as you followed your inner voice to join the Peace Corps! I look forward to reading your memoir! 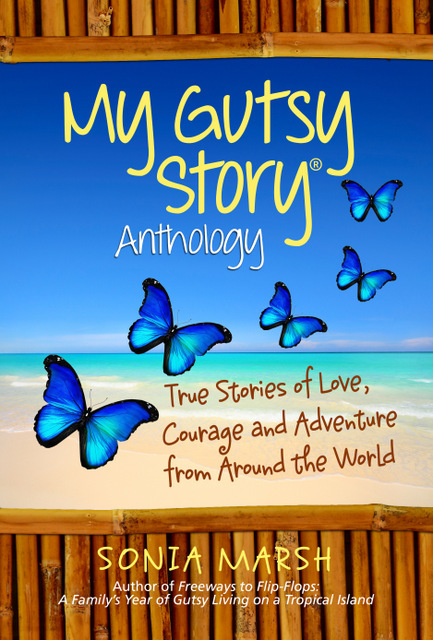 Thanks so much for posting your story!